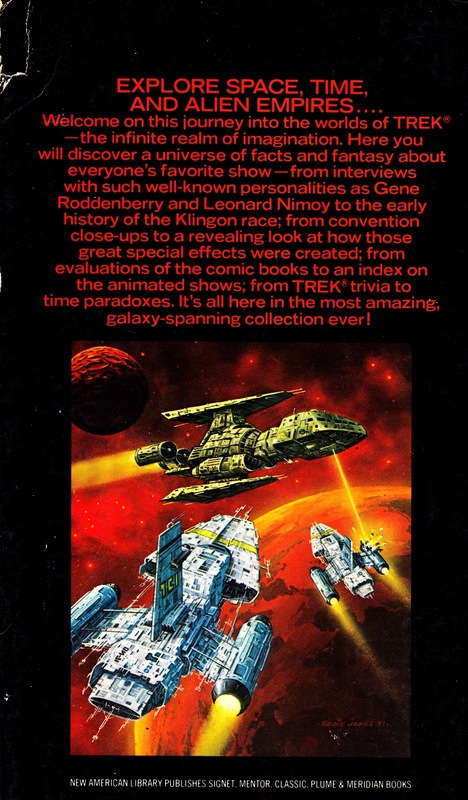 This is the first in the long-running series of THE BEST OF TREK paperbacks, published in the States, that collected fan-written articles from - as the name suggests - the fanzine TREK. I think I've only ever seen one copy of the fanzine itself (and I think that was fairly late-in-the-day issue) which makes me wonder quite how widely read it was. Certainly, copies of these books seem to surface far more frequently. All the articles are factual or speculative-factual (or just plain opinion pieces) with no fiction. That would have presumably crossed-over into the licensed territory of other publishers and would have evoked the fury of the lawyers. 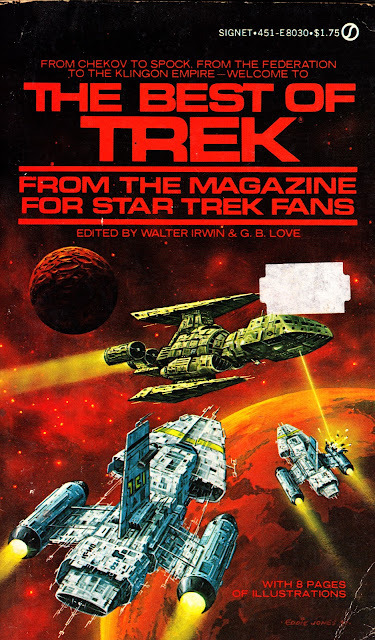 This first edition was published in April 1978, that nebulous time where the Paramount powers-that-be knew they should be doing something with the would-be franchise but couldn't settle on a TV show (STAR TREK: PHASE II), a tele-flick or a fully-fledged feature film. Note how the cover is vaguely reminiscent of the ships of the show (actually they look a lot more like miniature Battlestar's) but no-where near enough to trouble the studio's lawyers. The series was edited by Walter Irwin and G.B. Love and published by the Signet imprint of New English Library. The series continued until, at least, the ST:TNG era... and possibly later. - Chicago Con: $100,000 fan ripoff?